The 21-year-old US-American defeats Ryan Shane, who appeared in his first ATP Challenger final. No. 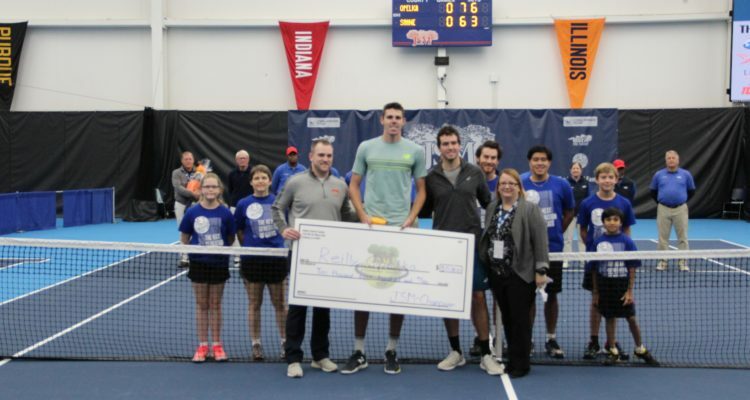 4 seed Reilly Opelka from the United States defeated fellow countryman Ryan Shane to win the 2018 JSM Challenger of Champaign-Urbana singles title. Opelka defeated the qualifier, 7-6(6), 6-3 on Saturday afternoon at Atkins Tennis Center. This marks his second-straight singles title this year following his triumph in Knoxville. Opelka fired 21 aces, winning 90 per cent of his first service points to secure victory in one hour and seven minutes. The 21-year-old has become the first US-American to lift three ATP Challenger singles trophies in one season since Bradley Klahn in 2014. Opelka earns $10,800 in prize money as well as 80 ATP-Ranking points. He will be the third player from the United States to make his Top 100 debut this year, joining Michael Mmoh and Mackenzie McDonald. Earlier in the day, No. 2 Aussie duo, Matt Reid and John-Patrick Smith topped Hans Hach Verdugo of Mexico and Luis David Martinez from Venezuela in a gritty match-up. The Aussie pair battled back after a second set loss to win 6-4, 4-6, 10-8. The victory in one hour and 13 minutes marks the fourth Challenger doubles for the duo with the last being in 2016 at the Levene Gouldin & Thompson Tennis Challenger in Binghamton, New York. This entry was posted in ATP Challenger Champaign, ATP Challenger Tour and tagged ATP Challenger Tour, JSM Challenger Champaign, Reilly Opelka.